First hollow stem occurs just prior to jointing and is the optimal time to remove cattle from wheat pasture. 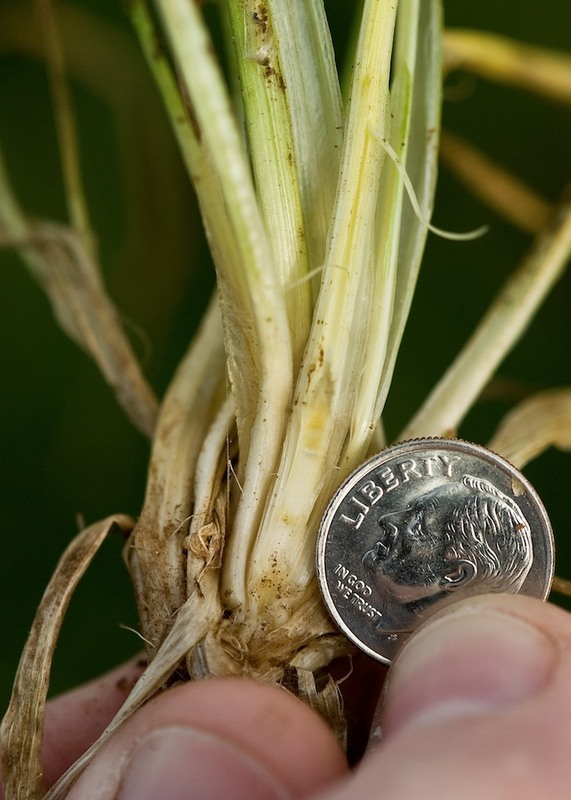 Grazing past first hollow stem can reduce wheat grain yield by as much as 5% per day and the added cattle gains are not enough to offset the value of the reduced wheat yield. Checking for first hollow stem is fairly easy. We check for first hollow stem in our forage trials each year. These can be used as rules of thumb, but you will still need to check your own fields. Our Chickasha plots were sown September 20, 2012 and have had fair growing conditions. First hollow stem was measured on February 18, 2013 and the results are presented in the table below. Gallagher and Everest are just past first hollow stem and Razor is not far behind. I predict that most varieties will be past first hollow stem by March 1. Spring-planted oat has been a “go to” forage crop for southern Great Plains beef producers for years. It is a good option when winter wheat was not planted in the fall due to wet conditions, or, as is the case this year, when wheat failed to emerge due to drought. Forage production potential for spring-planted oat is around 1,500 to 2,00 lb/ac, but you will need about 60 – 75 lb/ac of nitrogen to make this type of yield. Dr. Daren Redfearn has written a fact sheet detailing spring oat production for hay and it can be found at www.wheat.okstate.edu under “wheat management” then “seeding”. I will provide the Cliff’s Notes version below. Seed — Plant 80 – 100 lb/ac of good quality seed that has a germination of no less than 85%. There aren’t many options regarding varieties, so you will likely be limited to whatever seed is available in your area. The key is not to cut back on seeding rate, regardless of variety. Seedbed — Sow oat seed at approximately 1/2 to 3/4 inches deep. Most producers will fare better with a conventionally-tilled seedbed. You are planting seed at a time of year when the ground is already marginal regarding temperature. Conventionally-tilled seedbeds warm more quickly, which should speed germination. There is one exception to the conventional till recommendation. If you are sowing into a stale seedbed or a failed wheat crop that is very thin, no-till should be okay. Just avoid situations where excessive residue will keep the soil cold. Hay — Oat should be cut for hay at early heading. Normally, I would be sounding the wheat topdress alarm in early January. When you have 5.5 million acres to cover, it is important to start early. However, this year we have mostly kept the topdress rigs in neutral with a wait and see approach due to the drought. The recent rain brought life to portions of the Oklahoma wheat belt and it is time to make a decision regarding topdress nitrogen. I have posted three slide presentations with audio regarding topdressing wheat at my YouTube channel available by clicking here or by searching YouTube for OSU Small Grains. I have listed some additional facts and items to consider below. In order to have full benefit, nitrogen must be in the rooting zone by the time wheat is jointing. Jointing occurs around the first of March in southern OK and around the second week of March in northern OK.